Spec Trellising is proud to offer amazing brewhouses manufactured by InoxTecnica Veronese of Verona, Italy. More than 100 individual recipes can be stored via the 13” color touchscreen and all aspects of the brewing process can be fully automated including brew times and temperatures, thanks to the Siemens operating software. The entire brewing process can be controlled/monitored remotely via a smartphone or tablet. Never before have Brewers had it easier to produce handcrafted beers so effortlessly. 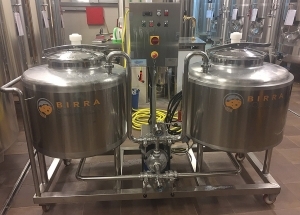 Available in 2, 3 and 4-vessel configurations, heated by either steam or indirect fire, and in manual, semi-automatic or fully automatic versions, InoxTecnica Veronese’s brewhouse are turn-key and customizable according to customer’s wishes. 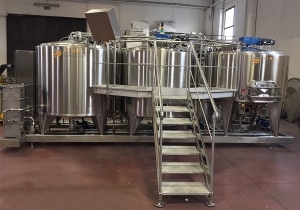 IV specializes in fully automatic brewhouses, reducing the possibility of human error while maintaining consistency thru the entire brewing process. All pumps and agitators are controlled automatically (by inverters) during every phase of the brewing. 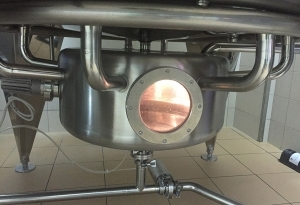 Modulating steam valves (on automatic steam-heated models) enable precise step mash temperatures so critical for the production of ales. Dual mash/kettle design, makes it possible to brew up to 3 batches in a single day. 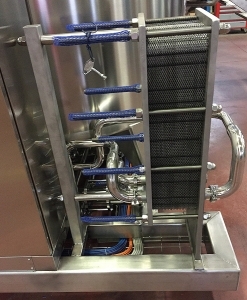 Heat exchanger with large sight glass and S/S filter. Wort Grant located beneath the lauter tun: illuminated, enclosed.